The Super Bowl is so much more than the annual championship game of the National Football League (NFL), and the experience is bigger than the three-hour game. It’s a massive week-long celebration of fan experiences, press events, parties, concerts, and a complete transformation of Atlanta into Super Bowl City. Atlanta hosted over a million visitors for a stadium that seats 72,000. The NFL vision provides excitement at every touchpoint in the city. 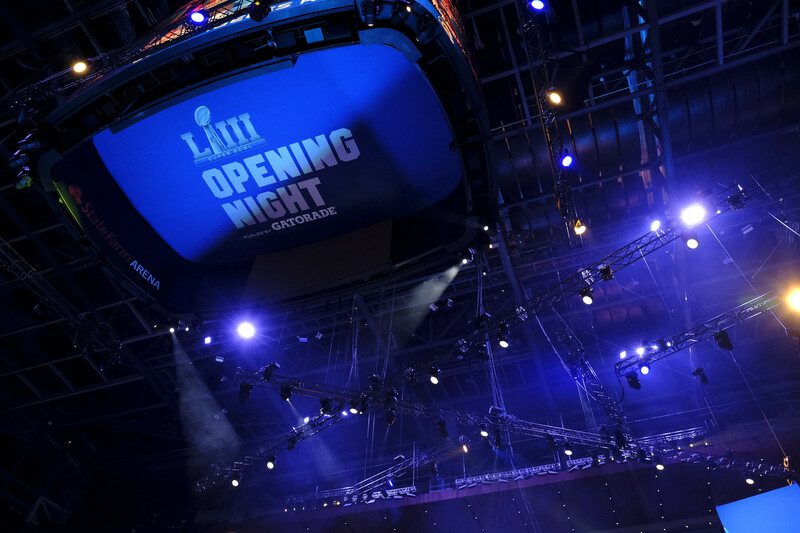 Freeman was honored to work with the NFL again to transform Atlanta into Super Bowl City by supporting over 40 events in five venues across eight days. Die-hard fans travel from around the country to watch their team battle for the ultimate title of Super Bowl champs. The audience ranges from the most fanatical of fans to public dignitaries, press, athletes, agents, sponsors, and more. Planning focuses on delivering exemplary experiences for each audience. This is the event they’ve been waiting for all season, and the NFL has zero margin for error. Freeman was brought in to support the access of worldwide press for the events, allowing public access to areas like radio show and broadcast locations while offering secure and confidential locations for pressers. Celebrations kicked off with Opening Night, where the two teams made their debut. 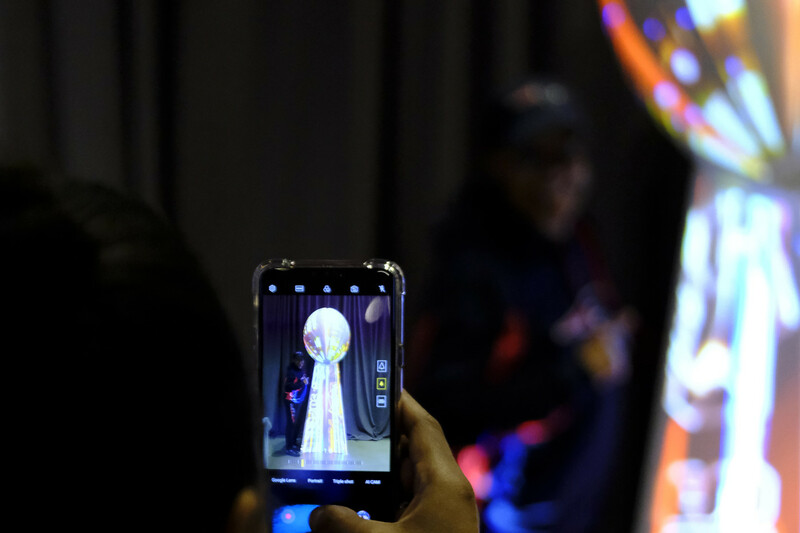 Before entering the arena, fans could snap pics and engage with various digital activations in the lobby, including projection mapping on the Lombardi trophy. 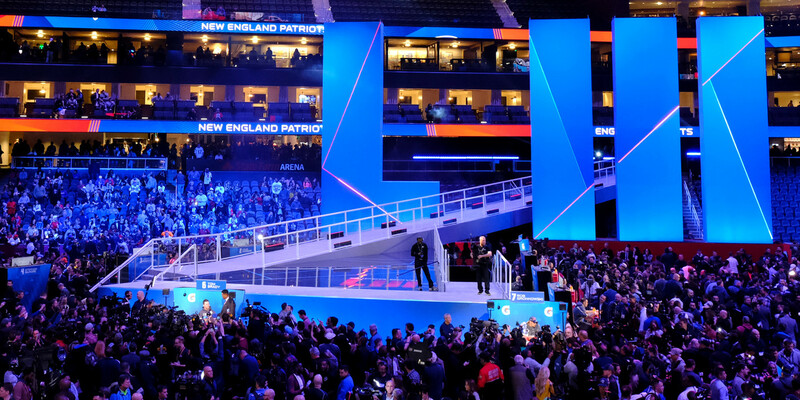 We built the city-themed structure and 30-foot Super Bowl numbers that led players into the press conference and created the perfect photo opportunity for media and fans. 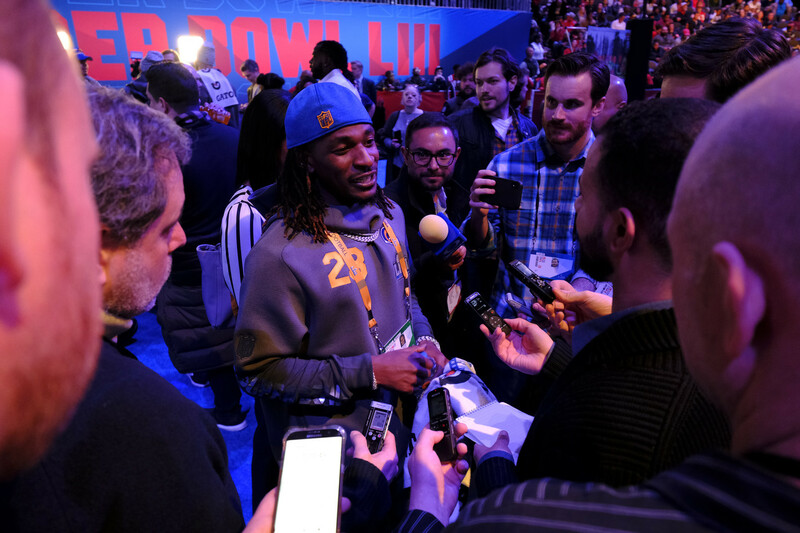 Freeman also worked with the NFL Special Events team to coordinate press conferences in different facilities throughout the week, culminating in the post-game interviews of both teams. Freeman worked closely with the NFL and other production partners to provide a world-class event. Over 1.5 million people flocked to Atlanta for Super Bowl week, and Opening Night was a sold-out event. The press spent over a week onsite and was able to set up shop easily. The immersive spaces allowed them to host press conferences, engage with big-brand sponsors, and capture stories with everything needed to be successful. Press and fans captured every moment with ease because the environment was designed with all audiences in mind. The debrief lessons will fuel further iterations for the next Super Bowl — in fact, planning is already well underway.